Former JBS National Field Director Jim Fitzgerald has supported Chris Stevens every step of his JBS career. Starting with hiring him as a coordinator, promoting him to Regional Field Director and recommending him for the top position in the Field, he couldn’t be more pleased to have him move up. Stevens recently accepted the position and has relocated to The John Birch Society headquarters in Appleton, Wis.
Chris Stevens settling in at The John Birch Society headquarters in Appleton, Wis.
“I am very confident that we have a very capable young man to do that job, and he should be here for many years to come. I think with his attitude and his ambition, it will reflect how well we do in the Field and increase dramatically the production of our forces,” commented Fitzgerald. Stevens, 42, has three daughters, one son, and has been married to his wife Mirelle for nearly 19 years. They made the move from Virginia to Wisconsin and are enthusiastic for him to begin working with the team in Appleton. As he dives into the behind-the-scenes process of how materials are produced and promoted, he bridges the gap from those working directly in the Field to those at Headquarters. Chris Stevens’s connection to The John Birch Society started when he was 20 years old. He described himself as “ignorant, apathetic, and agnostic,” not unlike a variety of young people today. A stack of New American magazines turned his whole worldview around. “It [The New American] totally opened my eyes to realize ‘hey there’s a big battle going on between good and evil.’ I figured out what side I wanted to be on and have been fighting ever since. I joined The John Birch Society at that time. And have been a chapter leader, political organizer, and eventually came on staff in 2010,” said Stevens. His mother gave him the stack of magazines, and she received them from a Birch member. It showcases how far information and perspective can travel and the impact that it can make. Stevens encourages members not to lose hope through this battle by continuously sharing truth wherever you can. “And so it’s Birching. You’re out there passing along information, but you never know where it’s going to end up. If he knew that he was going to pass this stack of magazines along and pretty soon the guy that was going to end up with them was going to be the National Field Director, he probably would have passed out a whole lot more,” said Stevens. With Birching as his specialty, he has already made strides at Headquarters to get the word out: creating PowerPoints for JBS’s top action projects to impact and inform community leaders, utilizing online ads for coordinators to generate more activity, and managing feedback from those in the Field. These projects and many more are key to achieving less government, more responsibility, and –with God’s help – a better world. JBS is strongest when coordinators, members, and headquarters are all focused and honed in on the same agenda. Stevens is aiming to move forward with sharing constitutional principles and bringing up leaders to keep America free. “We need to hit critical mass. Wake up a sufficient number of Americans in a sufficient number of congressional districts. And that number is 218. 218 is the magic number… When you win a sufficient number of voters in a district, it has a wide impact on every level of government, in restoring the principles of limited government that made America the freest and most popular nation on earth,” said Stevens. JBS Founder Robert Welch’s original plan was to have 1,000 active JBS members in each Congressional district, which would have enough influence to bring about adherence to the Constitution by elected officials at every level regardless of political party affiliation. Almost six decades of JBS experience has found that it only takes about 500 members who are organized and equipped to have that level of influence in a district. JBS is aiming for massive progress towards 218 congressional districts with the impact of those active members in the next five years. By bringing up leaders, raising funding, and educating citizens, America will be heading in the right direction. Stevens encourages activism outreach through recruiting to produce our “education action army.” “We need them to come join us and help us because if we have a sufficient sized education army, we win!” concluded Stevens. He encourages all those interested to learn more about JBS’ turn-key action plan by visiting JBS.org and exploring the options to join. On July 1, 2015, 32-year-old Kathryn “Kate” Steinle died from a bullet wound in her back. She had been enjoying a pleasant stroll with her father along one of the piers in San Francisco’s Embarcadero district. The bullet killing her came from a gun used by Juan Francisco Lopez-Sanchez who claimed he was aiming at sea lions. One of the bullets he fired ricocheted off the pavement and struck Steinle. She died two hours later. An illegal immigrant from Mexico, Lopez-Sanchez had previously been deported from the U.S. five times. Loose control of the Mexico-U.S. border certainly invited his return for a sixth time. But something else figured into the tragedy that claimed a completely innocent victim. Lopez-Sanchez was in San Francisco because the city had declared itself a “sanctuary city,” one where cooperation with federal immigration laws has been declared practically null. Once a city declares itself a “sanctuary” for immigrants, local policy prohibits police or city employees from questioning detainees about their immigration status, or even cooperating with federal immigration authorities in dealing with illegal entrants. Sanchez-Lopez was a known drug dealer who had been convicted three times in the state of Washington of felony heroin possession. He had amassed seven felony convictions total, but was still free to roam the country after his latest illegal entry. Deported to Mexico time after time, his return had become a certainty. And the gun he fired when Kate Steinle died had been stolen from a federal agent’s parked auto four days earlier. Not what anyone should call a good candidate for citizenship! The killing of Kate Steinle and the entire matter of sanctuary cities became an issue in the 2016 presidential race. GOP candidate Donald Trump mentioned Lopez-Sanchez as an example of the need to deport foreign nationals living illegally in the U.S. At first, Democratic Party candidate Hillary Clinton relied on the same term she used when questions were raised about her cavalier use of unsecured computers to conduct sensitive U.S. business. She said San Francisco had made a “mistake” in not deporting someone the federal government strongly felt should be sent back to Mexico. Clinton loves that word. Exactly one day later, the Clinton campaign effectively reversed what she had stated, claiming that Mrs. Clinton “believes sanctuary cities can help further public safety.” Choose which of those two positions you wish. But what about sanctuary cities themselves? In effect, they constitute a thumbing of the nose at legitimate laws designed to thwart unlawful immigration. If the entire nation adopted sanctuary policy, there would soon be no nation, because, as history has shown, a nation without control of its borders soon ceases to be independent. Arguments favoring the sanctuary declaration like to point to a seemingly related policy known as nullification, the refusal of a city or state to obey a law they claim has no legal basis. But there is a huge difference in these two ways of dealing with laws one doesn’t like. Sanctuary cities – sometimes even counties – choose to ignore federal mandates while still accepting federal aid of various kinds. Nullifiers are willing to accept the consequence of losing federal aid because of their refusal to abide by a mandate they find onerous, even abusive of higher law. The death of Kate Steinle raised national awareness about declaring sanctuary city status. Their very existence indicates a breakdown in the essential rule of law that is the hallmark of any free country. But there has been minor reversal regarding their use. There should be consequences wherever sanctuary cities have been proclaimed. Imposing them would be one small way of honoring the memory of Kate Steinle. Doing so would also help keep our nation free and independent. You don’t have to be a doddering senior citizen to remember the explosive period known as the Civil Rights Movement. If you’ve not yet reached six decades of age, you should be able to recall the not-unreasonable demands for equal treatment among America’s blacks. They wanted to be included; they wanted to be looked upon as full citizens; they wanted to be judged by themselves, not by the color of their skin. 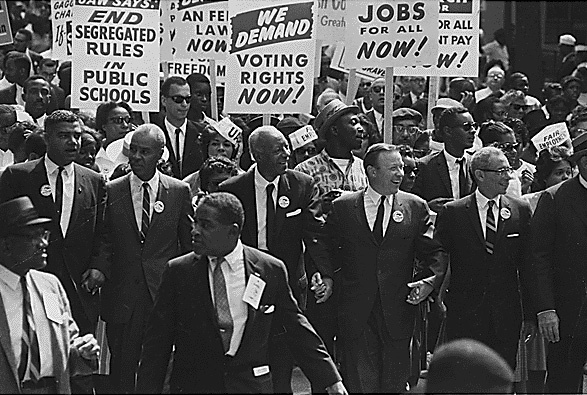 Civil Rights March on Washington, D.C. (Image by Rowland Scherman from Wikimedia Commons by the National Archives and Records Administration, public domain). In many cases, their reasonable desires were taken over by militants seeking to tear the nation apart. Cities like Detroit, Los Angeles, Chicago, and many more were torched. The victims were almost always the very people supposedly being helped. Subversive planning behind much of the chaos wasn’t supposed to be shown, even suggested. But it was the correctly identified spark leading to those fiery and frequently bloody days. Some said the destruction and death were necessary. There had to be an end to treating one class of people differently. “Integration” was one leading cry of protesters. But radical bomb throwers who wanted more turmoil, not less, seemed to be almost everywhere. “Burn baby burn” was heard from coast to coast. Then, the politicians and educators took some of these issues to the legislative halls and the courts. One result was forced busing where grade and high school kids were being put on buses and transported all over the area to satisfy some arbitrary quota based on race. At this point, black mothers joined with white mothers to protest the use of their children as pawns in an increasingly dangerous game. Did busing bring the various ethnic groups together? Not at all. In most instances, it made matters much worse. Some of the scars, mostly mental, still exist. Race relations that were improving 50 years ago are still improving. But now, a new and upgraded form of race consciousness has set in. Recently, one of the more prominent places to find it was at Harvard University during graduation week. There, black graduate students – obviously with university permission – staged a graduation ceremony for themselves. They didn’t get their diplomas at this event – they would be passed out later with all the graduates – but they sought to make a point and it wasn’t built around cries for diversity. No whites, yellows, or Hispanics were invited to participate. And none of these highly educated and high IQ possessors carried a placard calling for an end to judging fellow man by skin color. College is the place where we should be teaching and preaching the view that you’re an individual, and [you should] choose your associates based on other factors rather than skin color. Think about it. These kids went to Harvard and they less than anyone in our society should worry about feeling unwelcome and finding comfort zones. They don’t need that. In other words, Connerly doesn’t like the idea of separating people by color. Nor, as shown by his years of crusading against affirmative action, does he have a good word for judging people by gender. So it’s safe to say that he’s an opponent of this whole idea of alternative graduation ceremonies with their unofficial diplomas and awards. The Times didn’t ask him, but it’s likely he opposes similar alternative ceremonies for LGBT grads springing up throughout the nation. America became a better place when race consciousness and separating people started fading. Let’s keep it fading, not finding new ways to perpetuate all of it. Details about the June 4, 1989, crackdown on student protesters in Beijing’s Tiananmen Square remain hidden. The massacre, overshadowed to a degree by the televised confrontation of a single man facing a row of tanks, is nevertheless still commemorated throughout China. In semi-autonomous Hong Kong (the former British colony transferred to Mainland China in 1997), the date of June 4 has become an occasion for annual protests of tens of thousands. Image from flickr by David Holt, some rights reserved. The Chinese Communist government has never published the number of the pro-democracy victims of its bloody clampdown 28 years ago. Estimates place the number killed somewhere around many thousands. These were idealistic students who met death at the hands of soldiers sent to cancel the peaceful demonstration. Government mention of what happened at Tiananmen Square admits only to “turmoil” created by the demonstrators. The million who gathered in Tiananmen Square in 1989 weren’t the only Chinese protesting their government’s dictatorial rule. Demonstrators had gathered in scores (some say hundreds) of cities throughout China. In Shanghai, whose population exceeds Beijing’s, demonstrations grew even larger after news of the 1989 killings in Beijing had spread. Suppression of the protesters there did not face the bloody put-down occurring at the nation’s capital city. Over many years, Tiananmen Square has been the scene of other noteworthy events. A 1919 student protest in “the heart of the Middle Kingdom” is a fairly well remembered bit of history. Even more widely known is the choice of the Square by Mao Tse Tung to proclaim the People’s Republic in 1949. Since then, the Square has been the site of parades featuring troops with their weapons and an assortment of military vehicles. This year, a small bottle of liquor carrying the date 6/4/89 became a symbol for millions who want China to be a country where free speech and other basic rights are the norm. One bottle of the symbolically labeled liquor made its way throughout China and ended up in Hong Kong where it will likely be added to other reminders of the 1989 carnage. Unwilling to let even small protests go unpunished, Chinese authorities have arrested four men in Chengdu for their role in producing and labeling the small bottles of liquor. The four have already been accused of “inciting subversion of state power.” A court decree ruling against them claimed that they were “dissatisfied with our country’s socialist system.” The court got that right. But freedom isn’t getting better in China. Free speech is prohibited and subject to monitoring by two million government censors most of whom diligently monitor the Internet. Attempts to obtain detailed information about what occurred at Tiananmen Square in 1989 by entering the word “Tiananmen” on a computer produces nothing. That word and others used to commemorate what happened 28 years ago have been erased. China remains a totalitarian state ruled by the descendants of Mao Tse Tung. A hero to Communist Chinese, Mao and his Communist horde made it into the Guinness Book of Records as history’s greatest mass murderers. During recent years with vital help from the U.S., China has emerged as an economic powerhouse making and exporting millions of products for the West. But basic freedoms to speak, write, publish, practice religion, etc., are barred. And China’s leaders have never renounced their intention to defeat the United States. Credit Henry Kissinger, Richard Nixon, Jimmy Carter, and a lengthy parade of others for helping to empower one of America’s greatest enemies. While understanding what those in China have to go through, Americans must realize that they still can prevent this extreme government overreach in the U.S. Join with the organization at the forefront of this battle, The John Birch Society.